Many brands owners are comfortable only when money comes in. They are at their best when customers troop in t purchase their goods. As much as we know profits lubricate the wheel of brand’s progress, a total emphasis on profit making often makes brands to ignore certain vital issues which guarantee continuous prosperity of the brand. To sustain continuous profitability, there are certain ingredients which keep the brand going. One of such is to move every brand product consumer to loyalist. This should not be the final point but efforts must be geared toward making everyone an advocate. At the level of customers’ advocacy, brand spends lesser money on advertising and enjoys word of mouth marketing. Great as this may sound, nothing goes for nothing. Brands need to delight, listen to the voice, needs of the customers. Listening to the customers transcends just asking or hearing them out. Efforts must be made to incorporate customers’ yawning into product design as well as systematically incorporate their concerns in right experience delivery. Map out feedback strategy: listening and asking for feedback should be part of corporate strategy. A brand does not have all the answers to what will make each customer a loyalist. Until a brand is serious about what the customers feel, it does not consider a feedback mechanism. Ask for what is relevant and those things that matter: many brands have long list of questionnaire that are not even relevant or of any immediate needs of the brands. It is not the long list that counts; it is what is done with it. Always incorporate, act on feedback: No one feels valued if after going the whole process of filling a form nothing is done on the feelings expressed. Always act on the opinions expressed by the customers. When feedback management is properly done here are some of the ways it can aid brand loyalty. 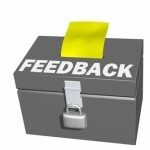 Effective feedback management aids words of mouth. It also enhances solid relationship between the parties. It also makes the customer feel a sense of belonging to a cause. When properly managed, feedback aids brand addiction and eventual brand advocacy. What do you think? Like the saying goes, ‘a picture is worth a thousand words’.